In oil and gas and most industrial environments a major problem is given by the permeability of cable plastic sheaths to humidity and aggressive chemicals, organic ones such as hydrocarbons and solvents and inorganic ones such as acids and bases. Penetration of these elements to the core of the cable compromises its overall lifetime performance. A conventional cable core protection against above mentioned elements is generally achieved by applying a lead sheath. Dekoron’s Dekabon technology provides an innovative and valuable alternative. The Dekabon technology is applicable to the instrumentation cables, multicore-control cables and thermocouple extension cables. 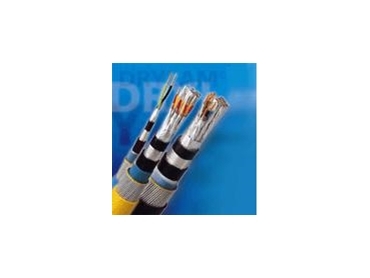 The Dekabon cable design is based on the use of the hermetically sealed, patented copolymer coated aluminium tape bonded to a plastic over-sheath. The bonded or laminate construction is commonly called a chemical moisture barrier (CMB) sheath. Corrosion resistance: Patented co-polymer which forms a critical part of f the bonded or laminate construction prevents aluminium from chemical attack, prevents corrosion and provides extended service life versus bare metal sheaths. Instead, lead sheaths are subject to corrosion in acidic as well as alkaline environments. Mechanical properties: Dekabon technology, Co-polymer - Aluminium – Polymer Sheath, combines the properties of the different materials. Generates a synergistic effect where strength of shielding tape is combined with flexibility of polyethylene. Results: improved bend performance, good resistance to thermal shrinkage, increased crush resistance, higher flexural strength and greater tensile strength. Dekabon cable is available from Maser Communications .